Janice, can you tell us a little about your non-fiction e-book book, I MUST DECREASE? Sure! As a comedic author, I usually write light-hearted stories. I’m known as the funny girl. I get the giggles and chuckle my way through most situations. Not everything is funny, however. When it came to my weight, however, I had very little to laugh about. Most of my readers didn’t realize the health crisis I was facing as a result of the added pounds. I needed to get things under control, so I started counting calories and watching what I ate. Out of that came my non-fiction book, I MUST DECREASE (which released in paperback in 2005). 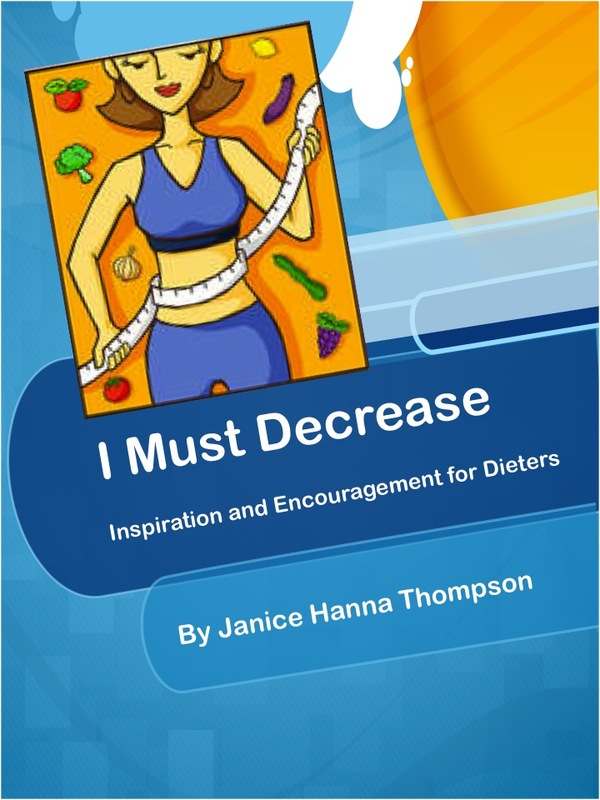 The book is set up in a daily devotional format and it meant to bring humor (as well as dieting tips) to Christians who need/want to lose weight. Why did you choose the title I MUST DECREASE? The title came as a result of a prayer time at church. I’d gone up for prayer and the gentleman praying for me used the scripture (John 3:30) as he prayed for me: “He must increase, but I must decrease.” For whatever reason, it got me tickled. I’d never thought about that particular scripture having anything to do with dieting before, but it suddenly felt right. Can you tell us about the layout of the book? · Ticklers: A humorous quote or “thought for the day” to tickle your funny bone. · Tidbits: A “Did You Know?” area offering tidbits of information from multiple sources. Why did you choose the humorous approach? Being overweight is nothing to laugh at, but most people who want to lose weight are tired of the serious, "Thou shalt not" approach. Many are ready for a lighthearted look at weight loss--"a practical devotional approach that offers scriptural advice in a way that encourages and never condemns. I decided to share light-hearted ways that dieters could lose weight and still keep their humor intact. This way I could keep my funny bone intact while losing weight. 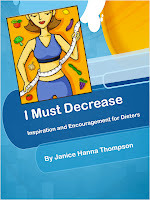 I MUST DECREASE contains tips and testimonies from several well-known (and much-loved) Christian authors, including Mary Connealy, Lena Nelson Dooley, Martha Rogers, Kristin Billerbeck, Laurie Alice Eakes, Carrie Turansky, Marcia Gruver, Deb Ulrich, Gina Bishop, Pam Hillman and Lynette Sowell. I adore these ladies and am so grateful for their input. I would say that anyone concerned with his or her weight (or the weight of a loved one) could benefit from reading. Whether you want to drop five pounds or 150 pounds, this is the book to help you achieve that goal. Can you tell us about the special feature? This e-book version of my devotional contains a few of my favorite low-cal recipes. Bon Appetite! What sort of feedback have you gotten from readers so far? 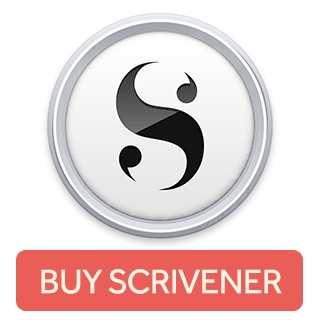 Why did you decide to offer the book for free for the first five days? I love the kindle select program and thought it would be fun to jump-start the process by giving away the book from February 22nd – February 26th. Readers can download the book for free by following this link to I MUST DECREASE. Can you tell us about your I MUST DECREASE Facebook group? I would love to! More than a year ago I started a private group on Facebook for a handful of ladies (like myself) who wanted to have the camaraderie of fellow Christian dieters. The group has since grown! Men and women are welcome to join us, but if you do, be prepared to share recipes, fun and tidbits from your personal journey. What happens in I MUST DECREASE stays in I MUST DECREASE! That’s why the group will always remain private. To apply to the group, follow this link to I MUST DECREASE. What happens when the “freebie” days end? The book will still be available for purchase on Amazon (and eventually on Barnes and Noble). Any advice for the road? Sure! Make sure you write down what you eat every day. This simple process forces you to look at the calories/carbs you’re consuming. It also makes you very aware of the slip-ups! I use a great site called fitday.com, which I highly recommend! Award-winning author Janice Thompson also writes under the pseudonym Janice Hanna. 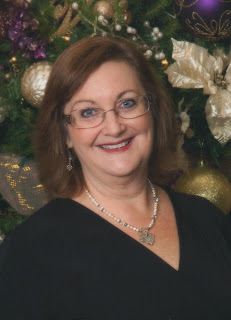 She has published nearly eighty books for the Christian market, crossing genre lines to write cozy mysteries, historicals, romances, nonfiction books, devotionals, children’s books and more. She particularly enjoys writing light-hearted, comedic tales because she enjoys making readers laugh. In addition, she enjoys public speaking and mentoring young writers. 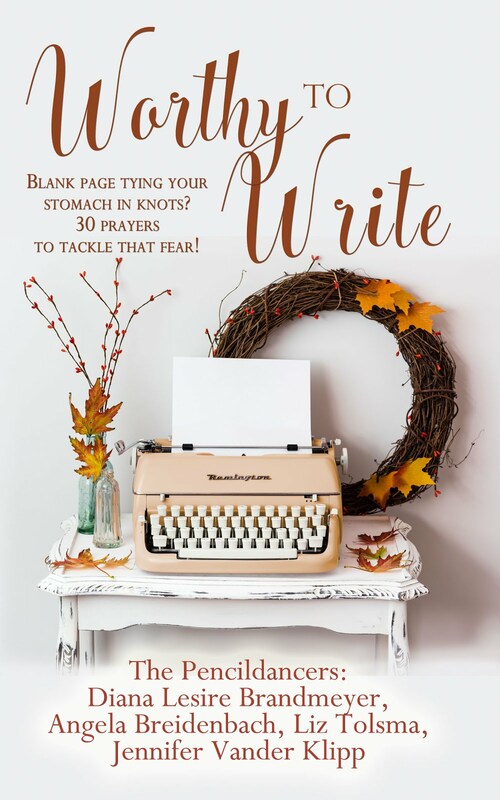 Janice is passionate about her faith and does all she can to share the joy of the Lord with others, which is why she particularly enjoys writing. Her tagline, “Love, Laughter, and Happily Ever Afters!” sums up her take on life.